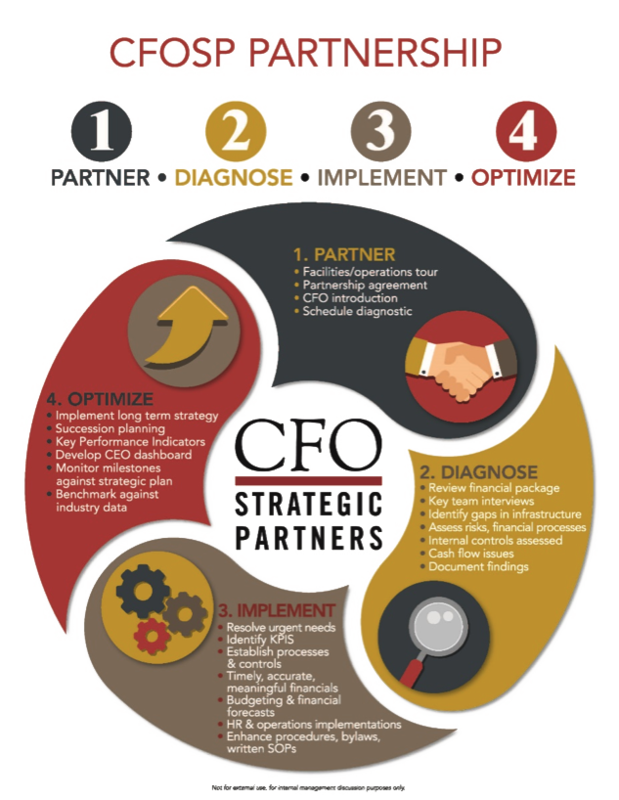 At CFO Strategic Partners we provide our clients with not just one CFO, but a team of CFOs, with the culmination of their experience at your disposal. Your lead CFO will have access to a collaborative resource of approximately 20 resumes in our team plus the collective organizational experiences and processes of our firm. This combined expertise may be utilized as needed, at any time, to guide you in reaching your goals. It is of great value to our clients to have access to the power of many and years of experience rather than just one full-time person. Our clients not only get the benefits of working directly with their lead CFO, they also receive the knowledge and expertise of our entire firm, including the intimate experiences we have had with over 1,000 clients during our firm’s nearly 20 years in business. When you choose our team, you receive the value of many. Our team is collaborative. We roundtable best practices, lessons learned, tactical approaches gleaned from the thousands of businesses and nonprofits that we have helped since our inception in 1999. Our CFOs are not bean counters. They are creative leaders that go beyond expertise in expected CFO functions to see the big picture to help you reach your next level of success. Our CFOs excel in the ability to look over the horizon to where your vision lies and become true thought-partners to the management teams we support. We know that part of success in business is the ability to react to change. Our partnerships are structured to be scalable. Our clients can dial up or scale back our support, as priorities demand. So whether you need a short-term project or a long-term solution, our model can serve your needs. Our services are a fraction of the cost of hiring a full-time CFO. The strategic solutions we offer are designed to enhance cash flow, maximize corporate value, and reduce risk. We are not afraid to jump in and get our hands dirty – guiding the accounting department, improving reporting, and defining key performance metrics that power the bottom line. Many CEOs hesitate to admit it, but they don't understand the reports and the numbers. CFO Strategic Partners clarifies vision and brings the numbers to life, providing valuable insights for effective business decisions. We strengthen banking relationships and can help position your business for future goals. In these ways, we pay for ourselves. But the real reason many CEOs turn to us is peace of mind. Our clients know they can trust our sound advice, thought leadership, and confidence in their financial systems—so the reports and numbers don’t keep them up at night.